We, Us and REDY2GO mean REDY2GO Pty Ltd ABN 47 165 281 279 and all associated companies, staff, and chauffeurs. Client, You and Your mean the individual/s, company or other entity making a reservation, and/or any representative or guest thereof. These Terms apply to all orders unless otherwise approved by us (such approval not to be unreasonably withheld). Any departure from and/or variation to these Terms stipulated in the order, must be approved in writing by us in order to be binding on us. The order is considered as final only after our acknowledgment of the order. These Terms apply exclusively to the supply of services specified herein and are not binding for additional services. The Client will in no case be allowed to put forward standards, specifications, statutes, rules and uses not duly accepted by us. Unless otherwise specified, our offer to supply services is open for acceptance within 30 days from the date at which it is established. After this date the offer is no longer capable of being accepted by you. 4. Charges start from when the vehicle leaves our base and finish at the time of the vehicle’s arrival back at the same location. 5. All bookings are subject to availability at the time of reservation. For operational reasons we reserve the right to substitute vehicles of similar category or capacity, where necessary. 6. REDY2GO reserves the right to cancel bookings, amend fares, itineraries, days and times of operation of services offered upon reasonable notice to the extent possible and otherwise as soon as is reasonably practicable (except in an emergency). The Client is responsible for confirming availability. 7. Booking costs do not include tolls, waiting time, meals, entrance fees, mobile phone usage, Airport Ground Service Charges, accommodation, venue costs or other incidentals unless specified. If specified, these will be added to the booking costs where applicable. Surcharges may apply to special events and public holidays. Between 12:00 midnight and 05:00 am an after hours premium of 33% applies to all booking costs. 8. No refund will be made after the vehicle is dispatched from its base. A non-negotiable cancellation fee applicable to the requested service will apply for all cancellations. 9. Payment of booking costs are on account (where an account has been established with us), in advance, by cash or by approved credit card. 10. Accounts are strictly thirty (30) days, payable within seven (7) days of receipt. If these terms are not complied with REDY2GO reserves the right to charge all outstanding amounts owed to the nominated credit card supplied. 11. Except where we operate as the carrier or service supplier, REDY2GO acts only as agent for persons providing the services such as hotels, airlines, charter vessels, air charter or venues etc. Except to the extent of any wilful, unlawful or negligent act or omission of REDY2GO, we accept no responsibility whatsoever in relation to the provision or failure to provide those services. 12. REDY2GO will not be liable, whether in tort, in contract or otherwise for any accident, delay, injury, irregularity, loss or damage to persons or property of any kind whatsoever and howsoever arising, caused or included during, or in relation to the carriage of any passenger or provision of services, except to the extent that any wilful, unlawful or negligent act or omission of REDY2GO caused or contributed to the accident, delay, injury, irregularity, loss or damage to persons or property. 13. The above provision shall be read subject to any implied terms, conditions or warranties imposed by the Australian Consumer Law or any other Commonwealth or State legislation in so far as such may be applicable and prevent either expressly or by implication the exclusion or modification of any such term, condition or warranty. 14. All prices and conditions specified or described on the REDY2GO website or other publications and on the application form are subject to change at any time without notice. .
A deposit of 25% of the total amount payable for each booking may be required unless prior credit arrangements have been made. Your reservation is regarded as confirmed once we receive your deposit. The balance owing is due and payable 14 days prior to the date of your event. Credit card details are required for all reservations and held as security against waiting time, cancellation, no-show and vehicle damage etc. You will be notified of any additional payment which may become due. Cash payments will only be accepted prior to the hiring and direct debits must clear our account before travel. A deposit of 25% of the total amount payable for each booking will apply. Your reservation is regarded as confirmed once we receive your deposit. The balance owing is due and payable 14 days prior to the date of your event. Credit card details are required for all reservations and held as security against deposits, waiting time, cancellation, no-show and vehicle damage etc. You will be notified of any additional payment which may become due. Cash payments will only be accepted by prior arrangement with REDY2GO. Your deposit is NOT refundable if your booking is cancelled within 30 days of the booked date. The total confirmed fee may be charged if the reservation is cancelled within 7 days of the booked date. Cancellations MUST be made in writing (email or letter) by quoting your booking reference number at least 14 days prior to the booked date. Once confirmed, your reservation price will not change unless you change the details of your booking or extend your time/s. Should you need to modify transport times, routes or dates, please advise us in writing. Every effort will be made to accommodate your request but we cannot guarantee to be able to do so. You have the right to cancel your reservation subject to our cancellation policy. Chauffeurs DO NOT have the authority to alter the booked times, pick up or destination addresses or routes without the prior consent of our fleet manager. To ensure the dependability of our service, it is necessary to reserve and dispatch a specific car and chauffeur to meet each Client. It is therefore necessary to charge for the service (as a hotel must charge for a guaranteed room) in the event the passenger is a "no show". You can avoid the "no show" charge by giving us a call before the chauffeur is dispatched. International bookings require 24 hours’ notice prior to the booked time. A “no-show” will be charged the total amount of the confirmed fee if you do not “present” at the nominated time and place. We will always endeavour to accommodate Clients who require excess time with our vehicles. Within reason and where possible, the vehicle will be made available to you for as long as possible after the specified period of your reservation..
Any waiting/over time will be charged in 5-minute increments at the appropriate rate for the vehicle nominated..
We will make every effort to arrive at your collection and destination locations on time. However, occasionally allowances must be made for unforeseen circumstances such as traffic, road and weather conditions, illness, vehicle breakdown etc. We cannot assume responsibility for circumstances beyond our control. Should there be a vehicle breakdown or mishap rendering the reserved vehicle out of commission, we reserve the right to substitute a vehicle/vehicles. We will make every effort to supply an alternate vehicle and advise you prior to pick up. Should we be unable to provide an alternate vehicle, a pro-rata refund may be paid. No guarantee can be made that we will supply an identical vehicle. Our Insurance policies cover our passengers whilst inside our vehicle/s and en route only. Limo Cruisers are fitted with security cameras. If you or any person forming part of your party damages or soils our vehicle interior or exterior, including all fittings and fixtures, you will be liable for all costs incurred to rectify the damage caused. If you or any person forming part of your party causes damage or behaves in a manner deemed unsafe or you or any person forming part of your party is considered intoxicated, before, after or whilst en route, we reserve the right to abort travel, evict you from the vehicle and terminate your reservation. No refund will apply in these circumstances. A police report & security footage will be submitted if necessary. Seatbelts are fitted to all our vehicles and must be used by all passengers whilst the vehicle is in motion. Child restraints/booster seats must be used according to RTA and/or applicable State or Territory authority guidelines. Use of the safety devices correctly will be the sole responsibility of the passengers or passengers guardian/parent and/or the person or entity confirming the booking or shown on our invoice. There may be instances where vehicles are unable to be negotiated over speed humps, through turns, driveways, road closures etc., rendering some locations inaccessible. In this case, we will endeavour to collect/deliver passengers at the closest possible point we can. Should the chauffeur deem any location or situation unsuitable for the vehicle, an alternative will be sought and used or termination of travel will occur if necessary - the chauffeur’s decision will be final and no refund will be paid. Chauffeurs will adhere stringently to all legal road rules at all times. All chauffeurs will plot his/her own travel route/s. Credit card details are required for all reservations and held as security against deposits, waiting time, cancellation, no-show and vehicle damage etc. You will be notified of any additional payment which may become due. Paying by a credit or charge card may incur a merchant fee of up to 3% of your total invoice. This fee will be added to your invoice and will be advised at the time of booking. From time to time it may be necessary for REDY2GO and /or its affiliates to charge a fuel surcharge in various locations. This surcharge may fluctuate and is determined by world oil prices at the time and set by us. You will be advised of any additional charges at the time of booking. For safety reasons, luggage and/ or containers, surfboards, skis or items of a large nature or flammable fluids or items may not be placed within the passenger cabin at any time. The chauffeur has sole discretion to terminate a hiring at any time. Government legislation strictly prohibits smoking and any illegal materials and substances in all licensed public vehicles. Alcoholic beverages may only be consumed en route, (except to/from school functions) by persons over the age of 18 and where full responsibility is assumed by the passenger/s. We will not be held responsible nor liable for you or any part of your party consuming alcohol nor the consequences that may ensue. Complimentary alcohol supplied by us will only be served once the vehicle has stopped. All alcohol consumption is your responsibility and at your own risk and you alone shall assume full liability. No food of any description is to be consumed inside our vehicles. If included in your package, chauffeurs will serve any food once the vehicle has stopped and passengers alighted unless otherwise specified. During peak times or on other occasions, we may use the services of other limousine companies. Although other companies will remain under our supervision, they will be governed by their own operational guidelines and operate at all times under their own insurance policies. In some locations gratuities and/or tipping are part of the general lifestyle and form part of the worker’s wage. In these areas a gratuity is automatically added to the amount payable and can be between 10 and up to 20% of the bill. In all other locations, gratuities/ service charges may be included in the cost of the hiring or given voluntary for services rendered. 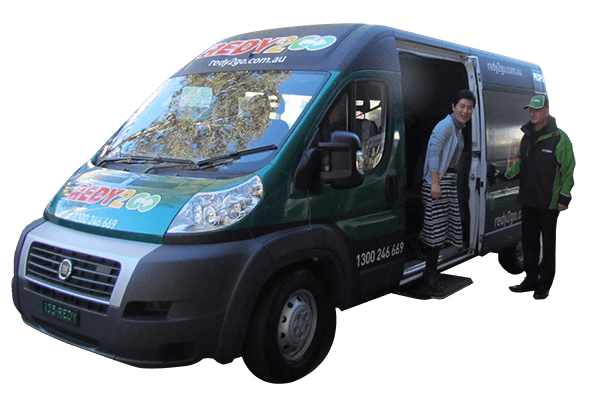 www.REDY2GO.com.au is a websites of REDY2GO Pty Ltd. By using our websites and/or the individual client centre, you agree to these Terms. Your continued use of our websites and/or their facilities constitutes your acceptance of these Terms. We believe that all information contained within our websites is correct. However, we do not guarantee the accuracy or reliability of the information given. REDY2GO Pty Ltd and its associated and/or related entities disclaim all liability and responsibility for any direct or indirect loss or damage which may be suffered by any recipient relying on anything contained in or omitted from our websites or publications. We do not gather personal information from children. Website visitors 16 years of age and under are required to have adult permission before submitting any personal information to us and/or our website.